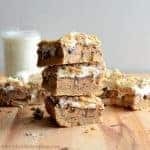 Reese’s Stuffed Peanut Butter S’more Bars includes a peanut buttery graham cracker infused cookie-like crust, Reese’s cups, chocolate, and marshmallow all melted together into one incredible dessert. 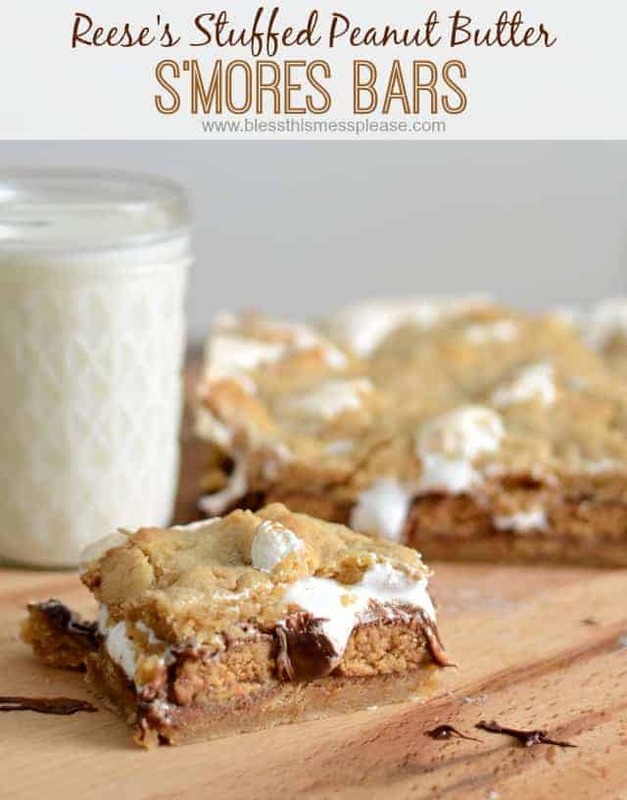 I was dreaming of s’mores and peanut butter the other day and then I found this s’mores bar recipes from Pinch of Yum. After a little adapting and tweaking I dare say I invented the most delicious dessert ever. 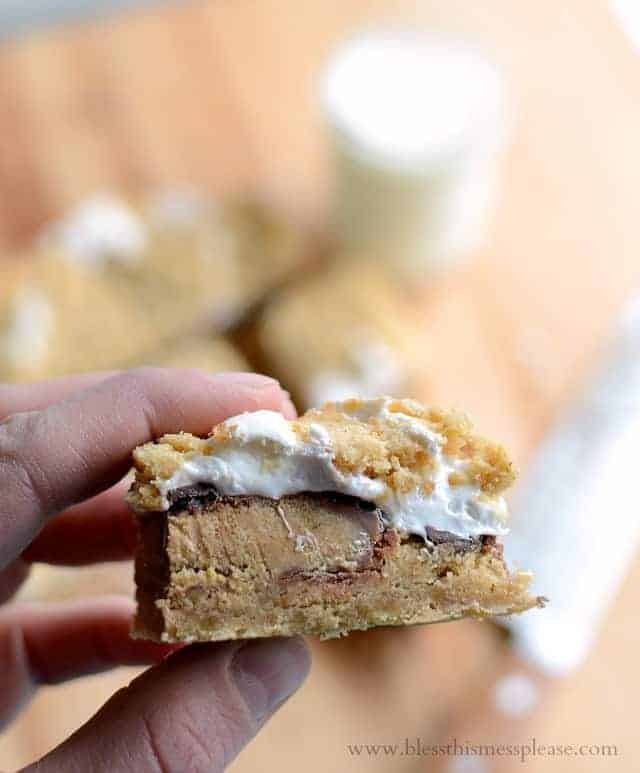 You seriously can’t go wrong with a peanut buttery graham cracker infused cookie-like crust, Reese’s cups, chocolate, and marshmallow all melted together into one incredible dessert. Make this today! Have a glorious Monday filled with one rich and gooey dessert. I actually used Reese’s eggs and they were fabulous and very full of peanut butter. 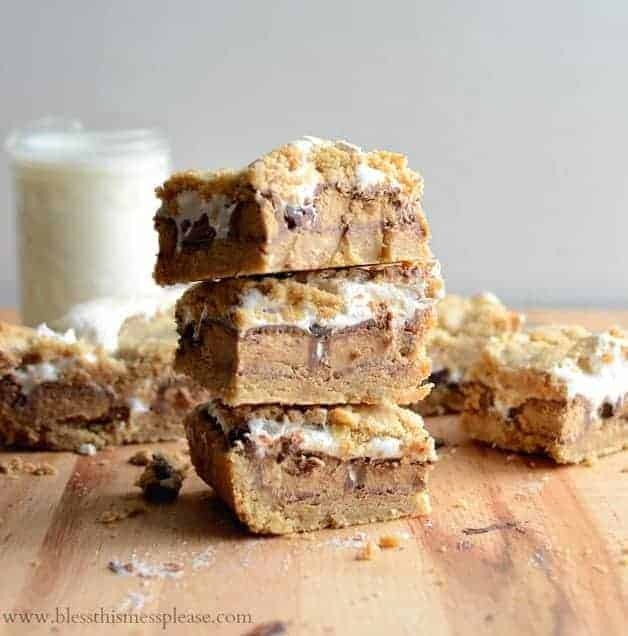 I think just about any type of Reese’s cup would work for this recipe! These are sticky! I had to stick my bars in the fridge for an hour before cutting. Preheat the oven to 350 degrees. Line an 9-inch square baking pan with foil (let the foil hang over all the edges so that you can use it to pull the bars out of the pan later) and grease the foil well. To make the dough combine the butter and sugar in a large bowl and beat until light in color and fluffy, about 3 minutes. Add the egg and vanilla and beat to combine. Add the flour and stir until well combined. Stir in the graham cracker crumbs. Press 2/3 of the dough into the bottom of the baking dish. 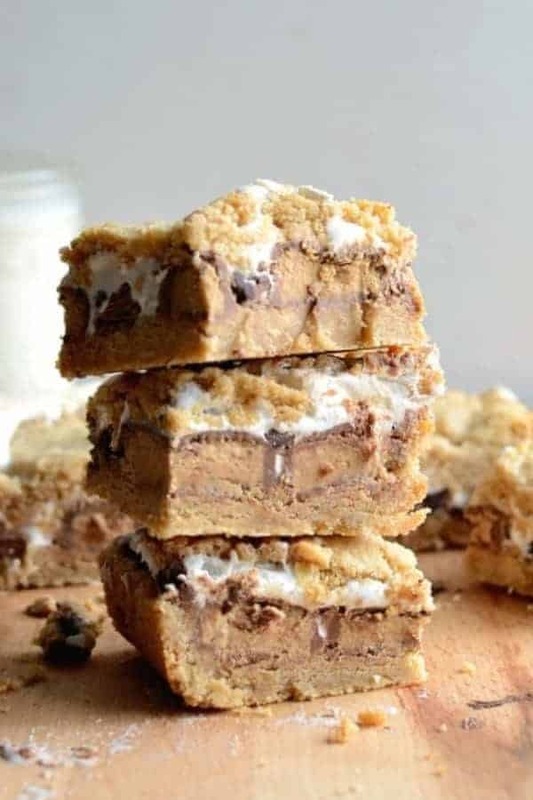 unwrap and place Reese’s Cups evenly over the dough, sprinkle the chocolate chips evenly over the Reese’s (letting them fall into the cracks), and then carefully spread the whole container of marshmallow creme over the chocolate. Then gently press the remaining dough evenly over the marshmallow creme. Bake for 25 minutes until the crust starts to turn golden brown. Remove from the oven and allow the bars to cook for an hour in the pan. After an hour use the edges of the foil to remove the bars from the pan. Let the bars cool on a wire rack (in the foil) out of the pan until set (this will take a couple of hours). To cut the bars use a sharp knife and clean it in between each cut. These are sticky! I had to stick my bars in the fridge for an hour before cutting. Thanks so much for stopping in. You all are the best. Excited to try these…on my free day.